There was a time when April 28 was known as Crocus Day in Winnipeg. 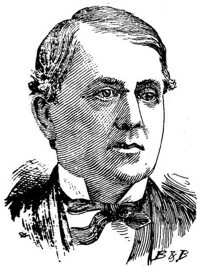 It commemorated James Wickes Taylor, whose portrait once hung in City Hall (old City Hall - prior to 1962). On this day, over many years, it was the custom for someone to place a bouquet of crocuses before the picture as a token of remembrance and affection. It used to be said, 100 years ago, that if God hadn't given us the crocus, then James Wickes Taylor would have invented it, for he gave them to his many friends. In the oil painting, there he stands, dignified and thoughtful, and the artist has placed his favourite flowers on the table beside him. James Wickes Taylor died on April 28, 1893 and Winnipeg went into mourning, for he was a man of extraordinary popularity and that in itself was somewhat odd. After all, he arrived in the Red River Colony as an American spy. He was sent here as a secret agent when it seemed that the West was "up for grabs", and Mr. Taylor naturally favoured annexation to the United States. But when Manitoba chose to join the Dominion, James Wickes Taylor became the official American Consul and he became a staunch friend of the new province. For 20 years, he was one of the chief architects helping to "transform the wilderness into civilization", and he was the spark plug of countless social and civic endeavor and triumphs. When his executors were tidying up his papers, they found the list of Red River ladies who had received his bouquets of crocuses...500 of them. James Wickes Taylor was the gallant gentleman who said it with flowers...and he gave us the crocus as our floral emblem. The actual choice of the crocus as floral emblem was the result of a vote taken in the schools by Manitoba children. 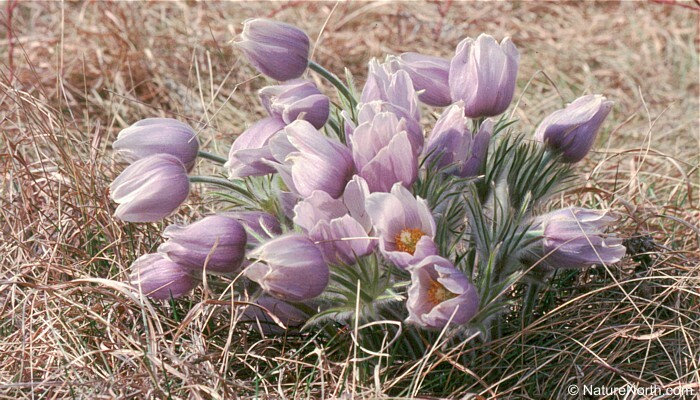 But the popularity of the crocus may have been in large part due to James Wickes Taylor. Manitoba's legislature made the crocus our official emblem in 1906. 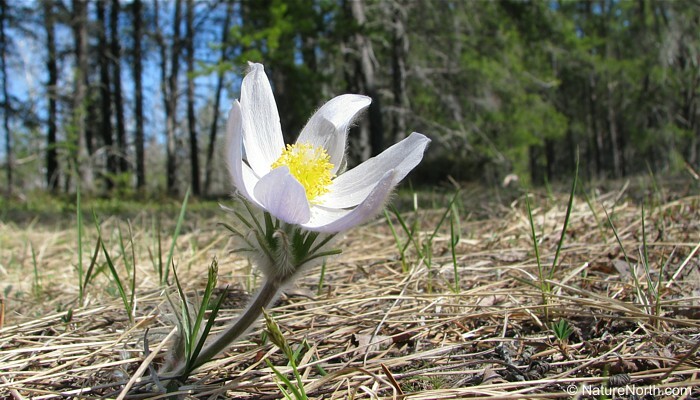 Crocuses often bloom during the Easter (Paschal) season, hence the American common name of Pasque flower. Pioneers used the mauve sepals (petals) to dye Easter eggs. What to do with a prairie crocus . . . .
Do a dance, rejoicing that spring has finally arrived! Look for a bee, warming itself. 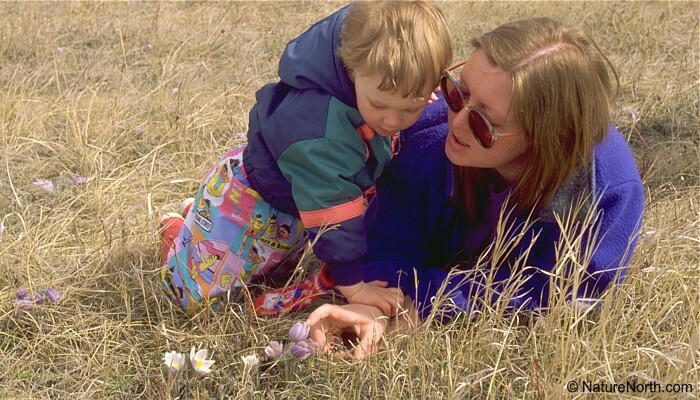 Try growing some crocus plants from seeds available at the Living Prairie Museum. What not to do with a crocus . . . .
Never pick a crocus. Picking the flower destroys valuable seed stock. Don't dig up a crocus. They don't transplant well and the hole left behind will probably sprout weeds in place of the crocus. Avoid excessive handling or eating crocus plants. Chemicals contained in the petals and leaves are irritants and mildly toxic. To enter the world of chiefs, Wapee, son of a Chief was to spend four days and nights atop a lonely hill until a vision of the man he was to be came to him. The first night, no visions appeared to him and he was downhearted. But with the dawn, the warming sun beamed upon a beautiful flower who opened her petals and nodded towards Wapee as if to welcome him. Wapee no longer felt alone. When night came again, Wapee curled his body around his new friend to protect her from the icy night winds. Three times he did this and three times when the Morning Star rose, visions came to him foretelling of great things to come. When Wapee rose to leave he said,"You have comforted and counseled me well these past three days and nights. What three wishes would you have me ask of the Great Spirit?" "Pray that I may have the purple blue of the distant mountains in my petals, a small golden sun to hold close to my heart on dull days, and a furry coat to face the cold winds in the spring." The Great Spirit was so pleased with Wapee's thoughtfulness, he fulfilled his prayer. So while they waken from sleep and rise from the bosom of Mother Earth, I stand here old and grey headed. 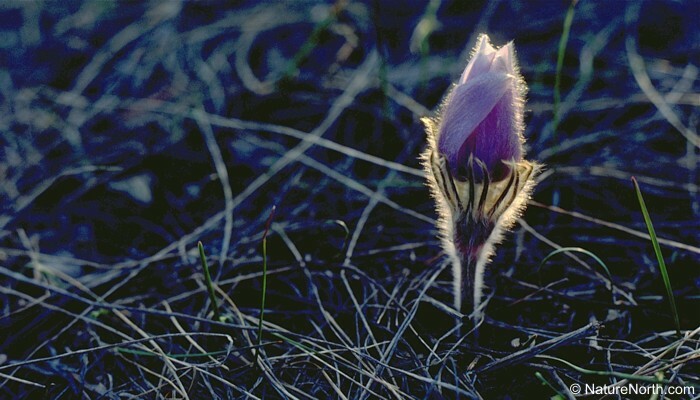 Crocuses can still be found throughout southern Manitoba, from mid-April to late May, depending on the weather and local conditions. 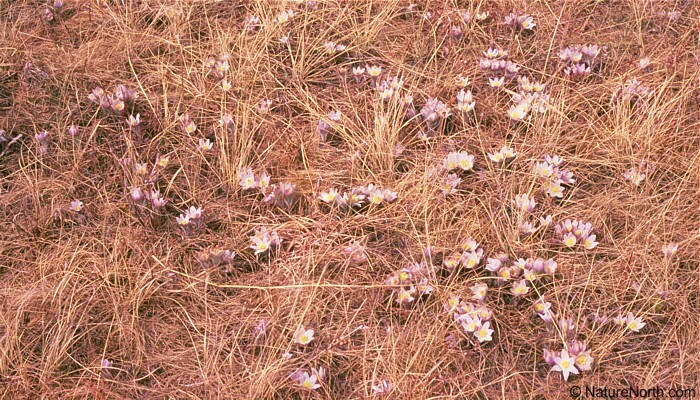 To find crocuses you usually need to find patches of intact native prairie, though some can be found in sparse forests where the soils are sandy. Many rail lines have strips of native prairie in their rights-of-way. Provincial parks and wildlife management areas often contain patches of undisturbed prairie. There are often habitat maps available for these areas to help you locate patches of prairie, so check with your local Parks or Natural Resources offices. South facing hillsides in prairies or old pastures are among the best places to look, as crocuses prefer well drained conditions. The town of Arden, Manitoba, up near Neepawa, is home to lots of real crocuses and real crocus fans! 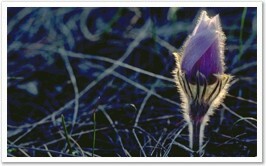 Check out their Crocus Photo Contest at the Arden, Manitoba web site. In Winnipeg, the best place to see crocuses used to be at the Living Prairie Museum, at 2795 Ness Avenue in St. James. 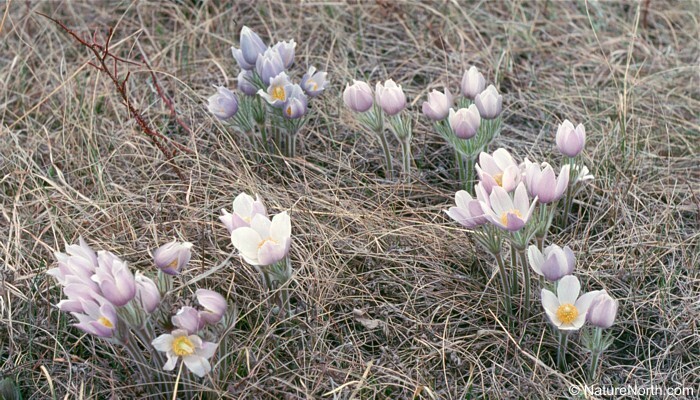 Sadly, crocus numbers have dropped off dramatically at Living Prairie. (NatureNorth is participating in studies to find out why.) 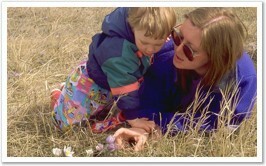 Each year, "Crocus Days" are celebrated at the Living Prairie Museum on the latter weekends in April. Rejoice at spring's arrival by participating in their special programs and guided hikes. Little Mountain Park and Bird's Hill Park are also good places to see crocuses. 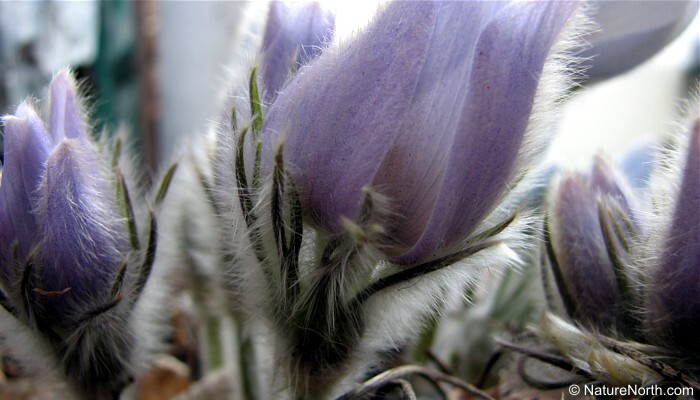 And that's "Our Prairie Crocus" by Johnny Caryopsis. Thanks for learning about Manitoba's floral emblem.